Steve Jobs was not a quiet presence. In Walter Isaacson’s biography, colleagues described how one could go from exalted hero to useless zero overnight. Love him or hate him, Jobs inserted himself relentlessly – with one notable exception. Pixar’s John Lasseter stands out as the one person who Jobs consistently granted far more space. To learn from Jobs’ genius, it’s worth asking why? The baseline explanation is that Jobs stood back because he didn’t know movie making as he understood computing. Fair, but Jobs was not shy in his time as CEO of Pixar. When he purchased the company from legendary director George Lucas, it was primarily a digital rendering company with unique hardware and software. Jobs bought it because he was into computer graphics. For a while, Jobs let the co-founders, Ed Catmull and Alvy Ray Smith, run Pixar without much interference. That didn’t last long. Job’s personality and penchant for control weighed in. For example, he insisted using his favorite designer, Hartmut Esslinger, to shape the hardware despite protests about his fees. He later pushed Pixar to sell to the mass market including opening sales offices in major cities. As the paragraph heading implies, the Jobs-Lasseter partnership starts with art. The first thing that differentiates Lasseter from Catmull and Smith is he’s an artist. Isaacson describes Lasseter as having a drive for perfection that rivals Jobs. Jobs was energized by artistic creativity, particularly when it was connected to technology. In a recent panel discussion at the San Jose Churchill Club, many of those who worked with Jobs also described him as an artist. Lasseter’s world view as a movie maker paralleled Jobs’ approach to creating products. When asked how he decides whether a movie idea is worth pursuing, Lasseter told the New York Times that he looks for heart first and then setting. “The heart has to be there from the beginning. You can’t punch up the heart”. Until Jobs, computers were built by engineers and based on highly efficient yet heartless algorithms. Consider the day that Bill Atkinson, a brilliant engineer on the original MacIntosh, raced in excited that he had figured out how to draw rectangles. Keep in mind that this was when character only, green screens dominated computing. Everyone was excited, except Jobs. Jobs liked the circles and ovals but wanted the rectangles to have rounded corners. Atkinson pushed back explaining that he was trying to keep the code lean. Jobs jumped up and pointed out that rectangles with rounded corners were everywhere. Jobs finally won him over as he pointed out that even no parking signs were “rounded recs” as they came to be called. Jobs’ artistry lured him deep into every new product program. Jobs drove Apple’s design philosophy far beyond the familiar minimalist exteriors. Jobs cared as much about areas that customers never see such as circuit board layouts or extrusion molds. Jobs wanted to go beyond finding a product’s heart; he wanted to grab its soul. 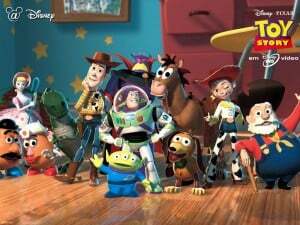 Lasseter wants to understand a story’s setting before making a movie because you can’t pick a story up and move it to a different world with different characters. Nemo lives in the sea, Cars on the road and Up! in the sky. The setting has to be someplace in which Lasseter would love to spend time. For Jobs, the setting was both critical and consistent: the individual. From the iconic Superbowl ad that declared “why 1984 won’t be like 1984” to the “Think Different” campaign adorned with famous faces such as Martin Luther King, Jobs put himself in the individual user’s shoes. That’s why Apple products are normally brought into the corporate world by folks who own them and not the IT Department. Lasseter tells stories for a living. Unbounded by reality boundaries of traditional cameras yet infused with all the capabilities of modern computer technology, Lasseter’s Up! lifts an old man’s home to the heavens with a bunch of party balloons. In Jobsian terms, animation is the ultimate “reality distortion field”. Storytelling is what fueled Jobs’ persuasive reality distortion field. He made arcing over the next impossible time or technology barrier seem essential as much as possible. That’s how he plucked Bill Atkinson out of academia at the University of Washington and into Apple. Jobs tried calling but Atkinson turned him down. He then sent him a pre-paid round-trip ticket and suggested what did he have to lose by visiting? Once together, Jobs wove a tale that described no matter how smart Atkinson was, it took two years for Silicon Valley innovations to reach Seattle. By definition, Atkinson would always be behind the latest technology. Alternatively, he could come to Apple and conceive it. Atkinson went on to invent the pull-down menu, MacPaint and more. The third shared factor is emotional vulnerability. As domineering as he could be, Steve Jobs was consistently vulnerable. He allowed his passion to take him to places from which manners and social norms normally protect the rest of us. Jobs could rant and cry simultaneously. The “I’m a PC, and I’m a Mac” ads embody this same vulnerability. The PC is constantly put in positions where coldness and lack of style are its vulnerability that the simple but warm Mac overcomes – but we always feel a little sad for the PC at the end. Lasseter and Jobs are both criers. Lasseter cries when telling Pixar employees that they will be acquired by Disney. From the early days when Mike Markula was dressing him down for his boorish managerial behavior to fighting for privacy regarding his cancer, Jobs cried often. The final factor that gave Lasseter space was his appreciation of minimalism. Jobs was not driven by wealth creation and possessions. In his younger days, his large Woodside estate was mostly unfurnished. In later years, buying a washer took two weeks that included framing alternative models against his family’s values of time, ecology and cleanliness. Lasseter was asked what is his favorite animation feature? As he gives his answer below, imagine that it’s Steve Jobs describing the latest Apple product. “Dumbo.” Hands down. “Dumbo” is my favorite film for many reasons. It’s very tight storytelling. It’s amazing to have a main character not speak at all through the whole movie. It is the most cartoony of all the Walt Disney features, and I love the style of it. The music, the characters, it’s just fantastic. It’s just over 60 minutes long. It’s a very well told story. And it’s so emotional too, especially for parents. It’s really amazing. It’s uncanny. I can see Jobs in his signature mock turtleneck and jeans walking back and forth as he introduces Dumbo to a crowd of Apple faithful. We can learn as much about what someone has to offer us by what they don’t do as well as what they do. Jobs didn’t mess with Lasseter.